> Uncategorized > Saints Legend Brian Morgan Turns 90. Brian Morgan, the first North Ringwood Football Club President recently celebrated his 90th birthday with family and friends. Brian was a member of the first Saints team when it began as Ringwood Catholic Rovers way back in 1962. After retiring from playing footy Brian attended to the players as Head Trainer, served on the Committee and became President in 1966 when the Club became North Ringwood. Brian held that position for 7 years and became our First Life Member. Always an athletics fanatic, outside football Brian encouraged a few fleet-footed footballers to become professional runners, who he trained and coached. Even at his sprightly age, Brian continues as an athletics coach as he enjoys it so much having had some 150 runners under his care over the years, including a couple of Stawell Gift winners and many place-getters. Pictured above (he’s the older guy in the middle) Brian celebrated his milestone with Brian Hamilton a member of the inaugural Saints team of 1962; David West who was a speedy North Ringwood wingman – so swift Brian couldn’t resist talking him into taking up running; Peter Graham – Saints Life Member, Committeeman, former Vice-President and long-time Senior Team Manager; Ian Clark – 4 time NRFC Best & Fairest (1970-1973) EFL Legend having won 3 League Best and Fairest, and also one of Brian’s long-distance runners; and Joe Tunstall – NRFC Life-Member – player and Committee. It was a great honour to be able to celebrate such a wonderful life Brian has shared with so many along the way. Brian still gets to a few North games during the season when his other beloved Saints – St Kilda are not playing. Please make sure you say hello to Brian when he is at the footy next year. 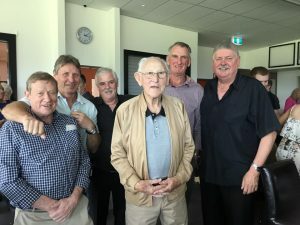 Bookmark this article Saints Legend Brian Morgan Turns 90.